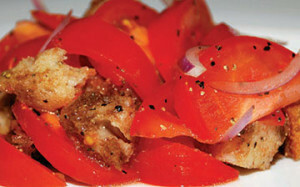 Panzanella Salad served at Canary By Gorji this summer from Zing! By Gorji Cookbook using sweet summer tomatoes. Who cares when they taste this good! Chef Gorji is using versatile summer sweet tomatoes as salad and dessert! He is making the most of these beautiful Texas sweet tomatoes and will be serving them as long as the good local supply lasts. Right now, he is getting these amazing sweet tomatoes from local Your Own Victory Garden in Plano, TX. Nancy Nichols talks about Gorji being a champion of local produce and his cookbook Zing! full of recipes designed to highlight the bounties of Texas, saying this simple recipe turns tomatoes and old bread into a delightful salad. 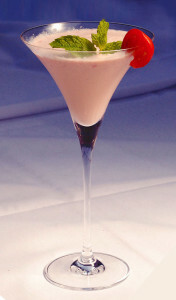 Tomato Ice Cream Smoothie with sweet summer tomatoes. This fun dessert is the third course on the GO TEXAN Restaurant Round-Up menu for the whole month of July this year. Gorji first introduced this savory and sweet dessert made with Texas sweet tomatoes and Tito’s vodka last summer at an Heirloom Tomatoes Dinner event partnered with Whole Foods. 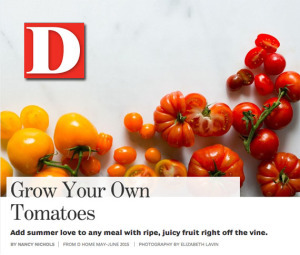 No Replies to "Versatile Sweet Summer Tomatoes Do Double Duty As Salad and Dessert"